Possibly the most eccentric of the 17 penguin species, the yellow-eyed penguin is known as "hoiho" in Maori, the indigenous language of New Zealand, to which it is endemic. A small breeding range and habitat deterioration have led to a decline in the population of the yellow-eyed penguin, which is classified as endangered on the International Union for the Conservation of Nature's Red List of Threatened Species. A citrine-like pair of irises is the yellow-eyed penguin's distinguishing feature. Its name also describes the bird's bright yellow headband, which surrounds both of its eyes and wraps around the head. With the exception of the yellow plumage on the top of the head, the rest of the yellow-eyed penguin's body is bluish gray; the breast and belly are white. Young penguins have gray eyes and do not display the species' distinctive coloring until they are 14 to 16 months old. A full-grown yellow-eyed penguin stands between 22 and 31 inches tall, which makes it a medium-sized species. 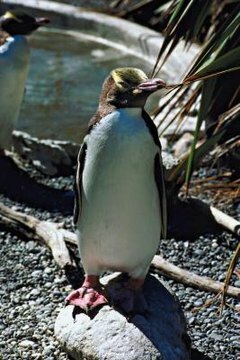 The range of the yellow-eyed penguin encompasses the southeastern coast of New Zealand's South Island, as well as the country's smaller Stewart, Auckland and Campbell islands. While penguins are typically associated with icy polar landscapes, yellow-eyed penguins make their homes and build their nests in coastal forests. On South Island, where much of the coastal forests have disappeared, they have been forced to settle in scrub vegetation. As is true of all penguins, yellow-eyed penguins are able swimmers and divers -- a necessity for a bird that must forage in the ocean for every meal. A yellow-eyed penguin may dive up to 200 times a day to depths of nearly 400 feet in search of small to medium-sized fish to feast on. Preferred species include squid, red cod, blue cod, sprat and opal fish. When yellow-eyed penguins meet, they emit a high-pitched vocalization that has earned them the name "noise shouters" in the local Maori tongue. Their extremely solitary lifestyle is yet another way in which the species differs from other penguins, which are generally social, colony-forming birds. The yellow-eyed penguin is so reclusive that breeding couples must mate in complete isolation, out of the view of other pairs, in order to successfully reproduce. Couples are monogamous for the duration of the breeding season, which begins in August and culminates in March. The average lifespan of a yellow-eyed penguin is 23 years; males are believed to live longer than females. Where Is the Warmest Climate a Penguin Lives? What Are a Penguin's Physical Features? What Kinds of Penguins Live Near the South Pole? What Kind of Animal Eats Erect-crested Penguins? How Do Penguins Know Who's Who?